Last Christmas, I got a 2012 Diablo III Wall Calendar. I put it by my computer, where I can stare at the artwork daily. So far, the artwork that Blizzard selected for each month has been interesting enough to inspire me to want to find out more about it. 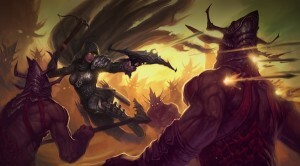 This blog is part of my series about the artwork in the Diablo III 2012 Wall Calendar. It wasn’t a huge challenge to figure out who “Ms. October” was. She is shown mid-vault, and is holding a one-handed crossbow in each hand. She is shooting multiple arrows at the head of her humanoid opponent while still in the air, and is likely about to start shooting at the armored foe she is vaulting towards with her other crossbow any second now. Our “Ms. October” is, obviously, the Demon Hunter. I wasn’t expecting to see the Demon Hunter again in this year’s calendar, since she already made an appearance as “Ms. April”. For whatever reason, Blizzard decided to include the Demon Hunter twice, but didn’t choose to show one female Demon Hunter and one male Demon Hunter. That seemed rather strange to me. But, then I realized that I have two Demon Hunters and both of them are female. I can think of a couple different pieces of art that show a female Demon Hunter, but not even one that shows a male Demon Hunter. This particular piece of artwork can be found on Battle.net in the Wallpaper collection. It was added there on August 1, 2011. 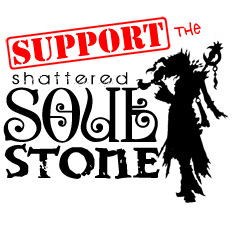 If you love it, you can (legally) download it from there, (in a variety of sizes). So, let’s review. The Demon Hunter was selected for both October, and April, (both female). The Barbarian (male) appeared in March. The Monk (male) was featured in June. The Wizard (female), (or, as we often say on Shattered Soulstone, “the Sorceress”), was selected for the month of August. I’ll give you a hint: he’s not in the artwork for either November or December. Nope. 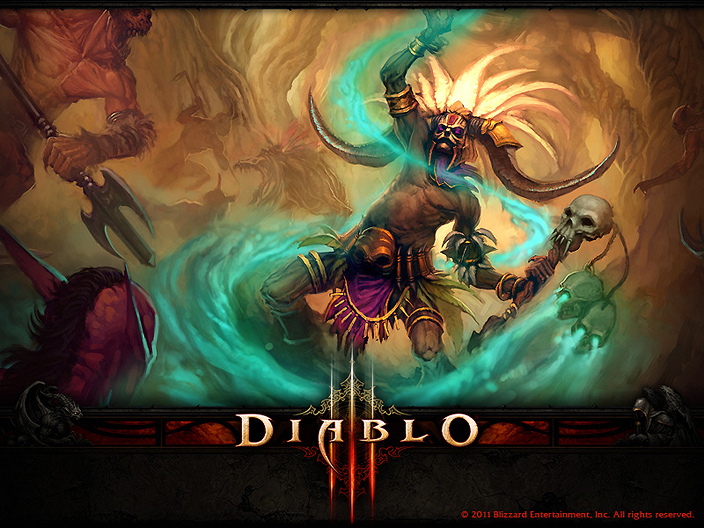 The Witch Doctor is the only player class that did not appear in the Diablo III 2012 Wall Calendar. Why? I have no idea, especially since Battle.net has a very cool wallpaper that shows the Witch Doctor that was also added on August 1, 2011. Why didn’t they use it in the calendar? I am now wondering of the 2013 Diablo III Wall Calendar will have two months of artwork that shows the Witch Doctor. I know the calendar exists, but I haven’t taken a close look at it yet. Before I end this blog, I wanted to briefly go over the humanoid opponents that are surrounding our “Ms. October” in the artwork above. I am fairly certain that they are Morlu. The concept of the Morlu goes back to The Sin War Trilogy by Richard Knaak. The Morlu make an appearance in-game in Diablo III. You will encounter them in Act IV. The video below actually shows a “glitch” that caused a Morlu to die, and yet, still be standing there. I doubt the bug is still in the game. However, the video does give you a good example of what a Morlu looks like in Diablo III. He’s got a very similar helmet, shoulders, and bracers.